Founder and driving force behind MediYoga International with her husband Anders. Works for a more yogic world as a teacher trainer. Elisabeth is head of development for MediYoga as a trademark and concept. Has created and developed, in 2007, the incredible popular course “Stress&Burn out” among many other courses like Yoga for Children, Chakra!, Yoga for the thyroid, Yoga for Flow, Mother and Baby Yoga…and more. 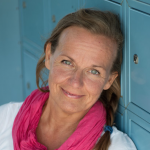 Together with her husband Anders she has developed the material and structures for the MediYoga instructor and Mediyoga therapist trainings. Elisabeth lives just outside Stockholm, Sweden with her husband Anders, a teenage daughter and a little dog. Motto: By all means be a mystery, everyone loves a mystery, but never be a mystery to yourself.